As a boy, Milo (Dylan Schombing) watched as his family and his whole village in Britannia was brutally murdered by Senator Corvus (Kiefer Sutherland) and his henchman, Proculus (Sasha Roiz). Milo’s village was a tribe of Celtic horsemen, blocking the local trade routes that the Roman Empire was desperate to have reopened. Milo was later captured and made a slave. Now that Milo (Kit Harrington) is grown, he is one of the best gladiators in Britannia. Graecus (Joe Pingue), his owner feels Milo’s – now known simply as “The Celt” – talents are wasted so far away from Rome. Graecus takes Milo and the rest of his gladiators to Pompeii, where their skills will be more appreciated. Along the way, Milo catches the eye of Cassia (Emily Browning), daughter of the leaders of Pompeii, Severus (Jared Harris) and Aurelia (Carrie-Anne Moss). Severus is desperate to have the new Roman Emperor invest in the rebuilding of Pompeii. As Milo prepares for his first big match in Pompeii against Atticus (Adewale Akinnuoye-Agbaje), who only needs one more win in the arena to secure his freedom, figures from Milo’s past come back into the picture. And Mount Vesuvius has its own plans. Pompeii is everything you expect from a historical drama/love story. It documents a real life event in the context of a poor man who attracts the attention of an upper class woman in the same style as Titanic. In fact, I was constantly thinking of Titianic as I watched Pompeii. The two stories are so similar, it’s eerie. If Titanic had included ominous, foreboding shots of the iceberg for every cut scene, the two would have been interchangeable. I doubt, however, that Pompeii will enjoy the same box office success as its predecessor. The acting isn’t superb, but it works for the type of film it is. Kit Harrington and Adewale Akinnuoye-Agbaje have a chemistry that translates well. The connection between Kit and Emily Browning, however, lacks the warmth and believability that Leonardo DiCaprio and Kate Winslet displayed. (One of the few differences between the two films.) It doesn’t take away too much from the film, but I just didn’t feel it as much as I should have. What Pompeii adds that Titanic was missing is overacting and an annoying accent. Thankfully, we have Kiefer Sutherland to fill that void here. The cinematography and special effects, as well as the gladiator fight scenes make up for the times when other areas were lacking. If you are going to see this, watch it in 3D. Sure, it is gratuitous for most of the movie. But when Mount Vesuvius unleashes its wrath on the city of Pompeii, it is really well done. The special effects crew obviously worked overtime on every detail, and it shows. Not just in the boulders flying at you, but small details, like the ash falling from the sky, all show what is capable with today’s technology. It is a bit predictable. 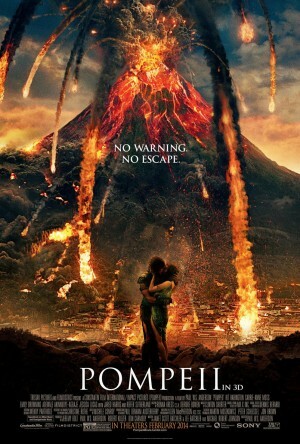 It is formulaic – that formula being the script from Titanic (down to the scenes where the heroine is handcuffed by the jealous boyfriend, and the hero must rescue her before the inevitable happens), but it works for the type of movie Pompeii is selling. It is aimed at roughly the same demographic Titanic, but with action scenes that will entertain the guys dragged to it by their significant others, something the other was missing. Don’t worry, ladies. Milo, with his perfectly coiffed hair, and Atticus are built and shirtless enough that you won’t mind the gladiator fights, either. I agree, the movie works, with more fighting to keep both guys and girls interested. Nice review!